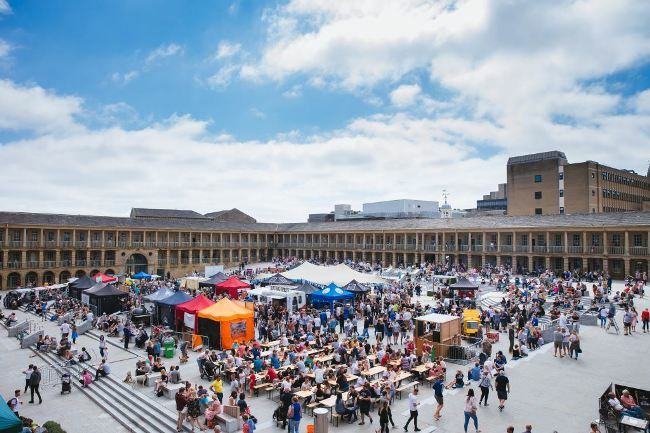 Around 120,000 people enjoyed a bumper feast of street food and music at The Piece Hall this summer for Chow Down, a series of independent food stalls that covered the central courtyard of the Grade I listed building with the very best street food pop-ups in Yorkshire. Over four weekends, from July to September, Chow Down, curated by Leeds Indie Food in partnership with New Citizens events, brought over 60 different traders to The Piece Hall. The event also welcomed a Yorkshire farmers and producers; craft beer and ale tent; cocktail, prosecco and wine bar and regular entertainment from DJs. A pop up communal outside dining space allowed visitors to stay and enjoy the atmosphere throughout the day and into the long summer evenings. Visitors came from as far afield as London and Newcastle to Chow Down each weekend and with a diverse line up of traders bringing treats and tastes from around the world all palates and preferences from vegan to coeliac, meat lover to those with a sweet tooth were well catered for. Traders reported record sales with 3,500 Pizzas, and over 5,000 portions of chips being sold, keeping the foodies of Halifax and beyond well fed and watered. Roger Marsh, chair of The Piece Hall Trust, said: “To put into context the incredible visitor numbers that Chow Down has achieved, it equates to half of the population of Calderdale visiting The Piece Hall and the wider area. Nicky Chance-Thompson, chief executive of The Piece Hall Trust, said: “It has been wonderful this summer to see so many people of all ages and backgrounds sitting together in the communal courtyard of The Piece Hall to enjoy some terrific food in the sun. Food, of course, has a tendency to bring people together and Chow Down created a compelling reason for people from all over the region to congregate. Simon Fogal from Chow Down said: “That was something special right? We are so pleased to have brought a new mainstream food & drink event to the North and in particular The Piece Hall. Lots of hard work has come together and created something unique. “The philosophy is to have something for everyone and keep people entertained whilst eating some of the best food in the North. We didn’t expect the amazing reaction from the residents of Halifax, the energy in the town from hotels to other venues was incredible. We like to work together and really give the town the spotlight.